Our World in Data – an online publication of the University of Oxford – aims to provide a global overview of changing living conditions over the last two centuries. 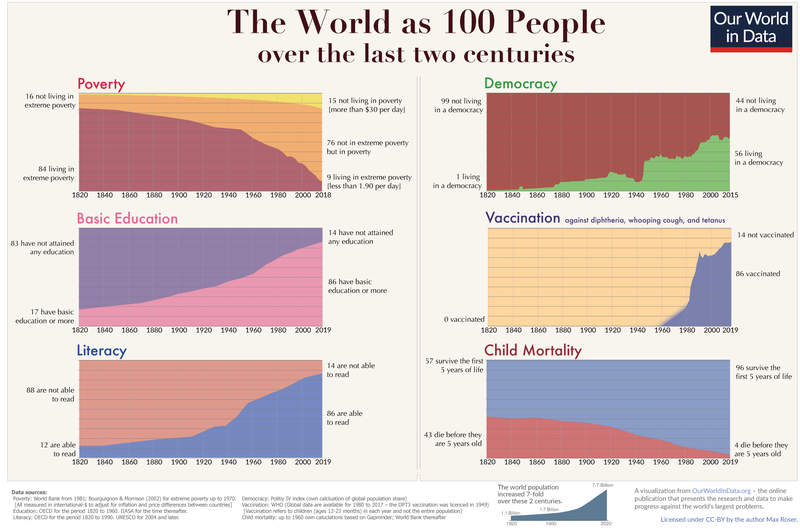 When asked, less than 10% of us believe that the world is getting better; but this chart – summarising long term change in areas like poverty, health, education, democracy etc. – describes an arc of astonishing human progress. e.g. today and every day since 1990 – 130,000 people moved out of extreme poverty. Most people I know were thoroughly discouraged by the political events of 2016 (me too); it’s extra important to remind ourselves that our world is becoming inexorably healthier, richer and better educated – beyond the wildest dreams of our grandparents; set against this towering historical achievement – Brexit and Trump are footnotes. I stopped my car recently to gaze on the marvellous new Forth Crossing – low sunlight catching its cables; I reflect on how human progress is a collaborative undertaking. As people across the world increasingly move from ‘survival’ to leading fuller and healthier lives – so the capacity of humankind to meet the challenges ahead – grows stronger by the day. There is much cause for hope. IPPR is the UK’s leading independent, progressive think tank; during the festive break, they released a report which deserves a look – Future Proof: how will Britain change in the 2020s? This one-pager-summary identifies powerful trends – economic, social and technological – which, in their view, represent ‘the future hurtling towards us’. Depending on the type of politics and institutions we build – these trends have the potential to create a more abundant, democratic and equal society – or a second ‘machine age’ that radically concentrates economic power; a future then ‘somewhere between Star Trek and the Matrix’. In the past year, the idea of a Universal Basic Income (UBI) has gathered momentum – mainly because people can see that the ‘gig economy’ (insecure employment) defines our future – and we will need a mechanism to ensure that all citizens have some money. In Scotland, both Glasgow and Fife Councils are looking at UBI pilots – but Finland has already taken the plunge: from last week (1st Jan) 2,000 randomly selected recipients on unemployment benefit will receive an unconditional 560 euros every month for two years. There is worldwide interest to see if/how this changes behaviours. Senscot subscribes to the Ferret – an investigative journalism platform; it’s not for profit and in the public interest. Before the holiday, the Ferret urged us to take another look at whether the Scottish taxpayer is being overcharged by private sector companies delivering major infrastructure projects – hospitals, schools, roads etc. There are political commentators in Scotland who allege that our SNP administration is far too cosy with certain of the big corporate lobbyists; our democracy depends on properly resourced journalistic scrutiny – if you’re interested, see here to subscribe to the Ferret. We frequently allege that our SNP Govt is over cautious in introducing progressive change to Scotland – so we should acknowledge when its policies boldly address the abuses of inherited privilege; this is the case with the ‘land rights and responsibilities statement’ – out for consultation till 10th March. The statement defines six important principles – the first of which says,”….ownership, management and use of land should contribute to the collective benefit of the people of Scotland”. George Monbiot comments: ‘no wonder the landowners are scared’. JOBS: Port Edgar Watersports CIC, Social Enterprise Academy, Firstport, Eco Drama, The Larder Cook School, Bandrum Nursing Home. EVENTS: Retail resilience: Retail Finance, 31 Jan; Leading Growth for Aspiring Leaders, 23 Feb; Advanced Facilitation Training, 7 Mar. The SENs Weekly Update: With the launch of the SE Strategy in December and a complementary Action Plan emerging over the coming months, 2017 is going to be a significant year for social enterprise in Scotland. Another report that will have an important bearing on how the SE Action Plan shapes up – particularly at a local level – is the Evaluation of the TSI Network (see Exec Summary) that saw the light of day just before Xmas. This much-awaited report offers 18 recommendations that, in essence, look to place TSIs as a key strategic partner in the delivery of locally agreed outcomes – as opposed to specifically focussing on the delivery of four functions. With the report acknowledging SE to be the ‘most contested’ of TSIs’ core functions, it will be important for all parties (including SENs and their members) to contribute to a discussion that finds the most effective and appropriate way of supporting SEs at a local level. The right wing economist, Milton Friedman, famously said that the sole purpose of business is to maximise profit – that for corporate officials to be distracted by ‘corporate social responsibility’ is to ‘undermine the very foundations of our free society’. Julie Nelson, a professor of economics from Boston, thinks that this is an ‘ethically scandalous’ false doctrine – which has reduced the discipline of economics to a ‘sham science’. Purely opportunistic behaviour, she says, far from driving a market economy, actually destroys it – good article. Big Society Capital (which has a reputation for exaggeration) estimates that Social Investment in the UK is worth £1.5 billion; but a report last year – The Forest from the Trees – calculates that mainstream banks lend twice that amount to the social sector. We need to ask what are the specific gaps publically funded social investment is intended to fill – how do their products differ? Everyone researching our sector agrees that more needs to be done to increase provision of affordable risk capital – available in lower amounts. Instead of a House of Lords – Scotland should have a ‘scrutinising chamber’ comprising an assembly of ordinary citizens; like jury service, the panel would be temporary – selected at random from around the country – but weighted to reflect the demographics of the population. This is one of the radical proposals in a report from think tank, Commonweal; another is for major overhaul of Local Govt: “Scotland can’t claim to pioneer Open Govt and maintain the most centrally controlled local democracy of any comparable nation”. In our last bulletin in December, we highlighted the Unity Grill in Ayr that was planning to set up a ‘social restaurant’ to address food poverty through community support and mutual assistance. Their crowd-funding campaign was looking to raise £5k. We’re delighted to hear that Unity Grill has exceeded its target and are now extending it to £7k. You can show your support here. Campaign ends on Sunday morning. This week’s bulletin profiles a new social enterprise in Eyemouth in the Scottish Borders. ReTweed offers women in the Berwickshire area the opportunity to gain the skills and experience for the creative industry and enterprise whilst producing original furnishings and fashions. With a growing demand for ethical fashion, crafts and furnishings, ReTweed has both social and environmental objectives – providing successful manufacturing and quality products for customers – as well as delivering on the Greener Scotland agenda of reducing, re-using and recycling – with over 70% of materials being recycled and products made using environmentally sound methods. See recent news article. Max Ehrmann is best known for his beautiful 1927 prose poem ‘Desiderata’ – but he wrote other stuff; this is extracted from ‘A Prayer’.